The Perfect Diet Tracker has a fully functional 7 day trial period. If you would like to continue to use the software after the trial period you need to buy an unlock key to activate the full version. The first step to activating the full version of the Perfect Diet Tracker is to buy a license or registration key. When you have completed your purchase you will receive an email with a username and key code in it. Now simply start the Perfect Diet Tracker and enter the username (usually your email address) and the key code into the boxes shown on the startup screen. If you are already logged into the software as a user, you can select the ‘Help’ menu, then select the ‘Enter Registration Key’ option to enter your key and enable the full version of the software. I was having difficulty with the full version download of the family licence that was bought on 28 Dec 09. I am uncertain how to confirm or determine that I have the full version downloaded to my computer. I tried to double check using the HELP menu option and choosing to enter the registraion key; but that is greyed out. Does that mean that I have the full version downloaded? I hope so because I am sure looking forward to getting on with this program. It looks fantastic! Your guidance and help will be much appreciated! Thanks for your order Shaune! If the option to register the software is disabled then you have successfully registered the software. The initial login screen will also simply have the current version number in the top right corner (the trial also has ‘trial version’), and of course the main difference will be after 7 days the software will continue to work! 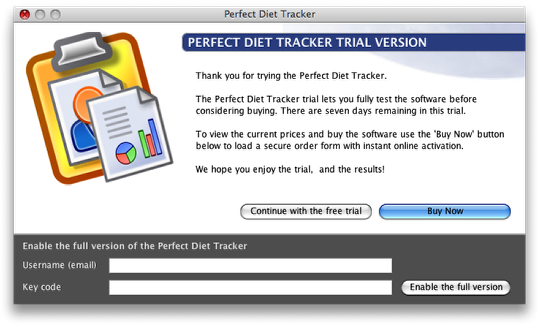 I’ve got a registered copy of Perfect Diet Tracker on my MacBook and have the database on Dropbox. I’d like to be able to look at the data I’ve already entered and enter more from my iMac. I’m the only user. How do I get another ‘front end’ onto the iMac? Do I need to register and pay for another copy, or is there another way? You can certainly use the software on both computers, and keep them in sync with Dropbox. If you purchased a personal license you can use this on up to two computers, simply install the Perfect Diet Tracker on your other computer and use the same key code to activate it. If you purchased through the Mac App Store, simply go to the store on your second computer, click on the ‘purchased’ tab at the top and click the install button next to the Perfect Diet Tracker, you will not be charged again and can install the softeware this way on as many Macs as you own. I am considering purchasing the full version of your software. How long does the software last once purchased and are all future updated versions free and included in this set price?